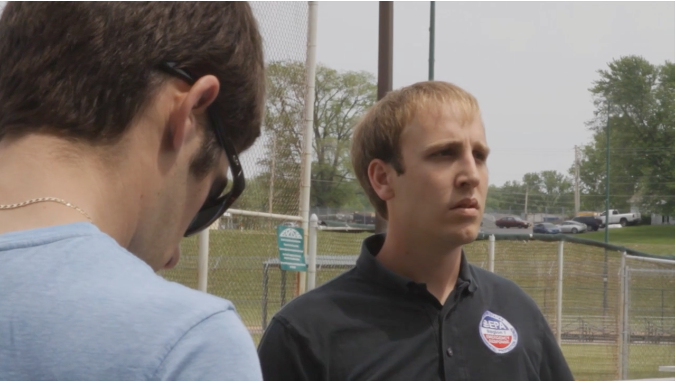 In 2014, a mystery man accompanied the EPA to the Bridgeton Municipal Athletic Complex . He refused to identify himself, leaving in his wake a gulf of government unaccountability and widening public doubt . The man in the center of the photograph above is EPA on-scene coordinator Tom Mahler of Region 7. The picture was taken in May 2014 when Mahler and other EPA officials began testing the Bridgeton Municipal Athletic Complex for radioactive contaminants. The agency later announced that it had found evidence of contamination but not enough to warrant concern, according to its guidelines. The EPA had reached this conclusion before they arrived at the site, however. Because weeks earlier then-regional EPA administrator Karl Brooks had pronounced the ballfields safe at a press conference at Bridgeton City Hall. Brooks claimed that the EPA had science on its side. In essence, EPA had reached its findings first and then verified them later. That’s not how the scientific model works. The EPA is supposed to operate with transparency and on behalf of U.S. citizens, too. But that didn’t happen in this case, either. The man in the blue T-shirt and sunglasses, with his back to camera, chose to remain anonymous that day. When asked by filmmakers to identify himself, he refused. He also refused to say for whom he worked. The survey was being paid for with taxpayer dollars. The EPA, a public agency charged with protecting our shared environment was conducting testing on publicly-owned property to protect public health — and the guy in the shades would prefer not to be recognized as being present for the occasion. It is unknown if he worked for an EPA contractor or another government agency. His identity remains unknown. The purpose for being there that day remains a mystery. He’s the man who wasn’t there. This frozen frame represents a moment in time. It is among the hundreds of hours of footage shot to make The First Secret City, a documentary that exposes a history of denial and neglect that originated with the Manhattan Project and continues today. The next screening of the film will be at 7:00 p.m. Wednesday Sept. 14 at the University of Missouri St. Louis. The EPA’s recent tests of West Lake nuke waste are not unprecendted. Sixty-five years ago the AEC published a recipe by Mallinckrodt Chemical Works on “roasting” pitchblende. “If you can’t stand the heat, get out of the kitchen” is President Harry S Truman’s most noted quip. But Truman is remembered more for actions than words. He ordered the atomic bomb attacks on Japan that ended World War II. Much of the uranium used in those bombs came from African pitchblende ore and was processed by Mallinckrodt Chemical Works of St. Louis. The classified work continued during the Cold War nuclear arms race that followed. As a result, radioactive waste was haphazardly strewn at sites across the region for 20 years. Embers of that fateful era are still burning today in North St. Louis County, where leftovers from the Manhattan Project remain a topic of heated discussions. “Heat” is exactly what the Southwest Research Institute in San Antonio applied in its laboratory experiments earlier this year. The purpose of research was to determine whether uranium waste from the makings of the first atomic bombs — dumped decades ago at the West Lake Landfill — threatens to release harmful radon gas if exposed to increased temperatures. Spurred by public concern, the EPA commissioned the study to see what would occur if the underground fire raging at the adjacent Bridgeton Landfill met the radioactively-contaminated materials (RIM) buried at the West Lake Superfund site. The question has been smoldering since December 2010, when landfill owner Republic Services reported the hellish conditions. The good news, according to the EPA, is that the tests confirmed that baking RIM does not increase radon gas emissions and in some instances decreases them. Community activists have hotly contested those findings, questioning whether the simulated laboratory conditions are comparable to the real fire in the hole. The latest assurances appear to be another attempt to stem the firestorm of public distrust that surrounds the topic. Meanwhile, the subterranean smoldering event, as the EPA prefers to call it, continues to burn closer to the RIM. As the sparks from this drama inevitably create more smoke than light, it should be kept in mind that the flouted tests are not the first to measure the effects of heat on pitchblende. That distinction goes to the Atomic Energy Commission, which published a Mallinckrodt report on the subject in December 1950. The title of the 65-year-old tract, “The Roasting of Pitchblende Ore,” seems more applicable to a macabre cookbook than a scientific treatise. It also conjures up a combination of Arthurian alchemy and biblical fire and brimstone. Brimstone is the ancient word for sulfur. Up to ten percent of the content of the pitchblende ore was comprised of sulfur, according to the Mallinckrodt study. In the 20th Century, the Mallinckrodt scientists were not concerned about the health impact of the sulfur or radioactive materials for that matter. Instead, they theorized that removing the sulfur by cooking the pitchblende would save the company money and increase profits. What Did Monsanto Burn at West Lake? When the West Lake Landfill in Bridgeton, Mo. is mentioned nowadays, it is most often associated with radioactive waste produced by Mallinckrodt Chemical of St. Louis, and the underground fire raging nearby. But records uncovered by STL Reporter indicate another locally-based chemical behemoth had earlier burning desires for the West Lake property. Bridgeton City Council minutes from May 7, 1969 state that representatives of the Monsanto Chemical Co. asked the council to approve an application for a permit to run a pilot plant at the West Lake Quarry. The quarry and the landfill were then two parts of the same operation. Monsanto spokesmen Evan Robert and Ted Bielski told the council that Monsanto had formed a new business enterprise earlier that year to address an array of pollution problems. The plant would “heat material in enclosed chambers and the residue will come out a sterile product,” according to the council minutes. At the same meeting, the St. Louis County Health Commissioner told council members that the county had already issued an air pollution permit for the pilot plant, which was expected to operate for the remainder of 1969. The minutes lack details of the proposed plant, but appear to outline plans for Monsanto to operate an incinerator at the location. Prior to presenting the proposal to the council, Monsanto would have almost certainly have negotiated an agreement with West Lake’s owners. West Lake’s operation already included a cement kiln, which could also have served as a possible waste incinerator. Councilman Edward Boenker, the owner of an adjacent farm, asked whether Monsanto intended to use waste from the landfill. The minutes do not indicate whether the company representatives responded to the question. But ten months later, it’s clear the incinerator was up and running at the site. A St. Louis Post-Dispatch story on March 15, 1970 includes a photograph of the incinerator and says that trash being hauled to the landfill was being burned in the incinerator. A Monsanto subsidiary — Enviro-Chem — used an experimental process referred to as “pyrolysis” to burn the waste and then capture and burn the resulting gases. “All that is left after the burning of the trash, spokesmen for Enviro-Chem say, is dirt, rock or glass that were present in the original composition. These by-products can be used, they say, for land fill,” the Post-Dispatch reported. The story said the company was considering using the gas emissions from the process to generate energy. “D.L. Chapman, director of the solid pollution control department of Enviro-Chem, said that a decision would be made by this year (1970) whether to try to market the company’s process,” the news story said. At the Bridgeton City Council meeting in 1969, the Monsanto representatives said that “the end result will be a totally sterile landfill,” according to the council minutes. They estimated that the pilot plant would treat between 50 and 100 tons daily. Nothing in the document says specifically what kinds of wastes would be treated. But the Monsanto representatives did describe the end product as “sterile,” which suggests that the untreated waste was harmful. In the late 1960s, Monsanto produced a component of Agent Orange, a defoliant used by the U.S. military during the Vietnam war. Dioxin, is a toxic waste byproduct of Agent Orange. The EPA later discovered that dioxin contaminated the town of Times Beach, Mo. and dozens of other sites in Eastern Missouri and incinerated it. The clean-up of those sites took decades to complete. Monsanto also did work for the Atomic Energy Commission during the Cold War at Clinton Laboratories in Oak Ridge, Tenn. and Mound Laboratories in Miamisburg, Ohio.